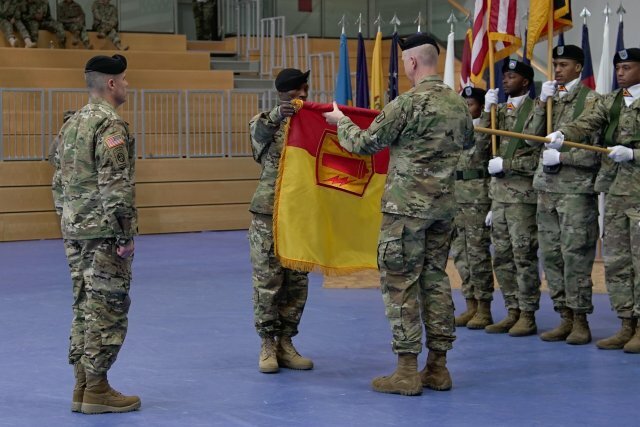 GRAFENWOEHR, Germany (Nov. 30, 2018) — The 41st Field Artillery Brigade uncased its colors in an activation ceremony that was combined with an assumption of command and responsibility for the unit, here, today. With a history dating back 100 years, crossing oceans and continents, the 41st FA Bde. has been known by many names and called many locations home – including 33 years in Babenhausen, Germany. The 41st FA Regiment formed in 1918 in Virginia; in 1924, was re-designated as the 41st Coast Artillery in Hawaii; re-activated as the 41st FA Group in Oklahoma in 1952; spent 1972-2005 in Germany, while also changing names to the 41st FA Bde. ; re-activated in Texas in 2007 under the name of 41st Fires Bde. ; reverted back to the 41st FA Bde. in 2014; and inactivated and reflagged as the 1st Cavalry Division Artillery in 2015. The unit had a role in World War II and also saw many deployments from Vietnam to Kosovo, and from Albania to Iraq. “Today we continue in a rich history; a rich history of a great unit,” said Brig. Gen. Christopher LaNeve, commander, 7th Army Training Command, “and a rich history here in Germany. This great brigade is continuing to answer our nation’s call to arms and has never failed the colors of our country. “Today, this brigade starts to write their own legacy, their own stories and their own triumphs once again,” he said. The 7ATC has training readiness authority over the newly-activated 41st FA Bde. and its subordinate units yet to arrive – two Multiple Launch Rocket System battalions, a maintenance battalion and a signal company – who will provide long-range, precision fires across Europe: Headquarters and Headquarters Battery; 589th Bde. Support Bn. ; 232nd Signal Co.; 1st Bn., 6th FA Regiment; and 1st Bn., 77th FA Regt. “You have the opportunity to start traditions within this organization, to showcase the tough, realistic training that you will be able to accomplish right here in this training area,” LaNeve added. The brigade’s activation is one of the first in Europe as a result of the 2017 National Defense Authorization Act, showing continual U.S. commitment to NATO and its collective defense. The significance of standing up the 41st FA Bde. again in Germany is that it enhances the collective training objectives of 7ATC and U.S. Army Europe, as well as the readiness of rotational forces training here, according to Command Sgt. Maj. Samuel Zoker, senior enlisted advisor, 41st FA Bde., while returning U.S. fires capabilities back to USAREUR. Soldiers and families will continue to arrive as the 41st FA Bde.’s units activate through 2020, making Bavaria the brigade’s new home. Following the ceremony, the unit already began to build and cultivate bonds with the local community, signing a partnership agreement with the city of Grafenwoehr, while respecting the tradition of Grafenwoehr Training Area as it was first established by the Royal Bavarian Army as a field artillery training site. Honoring the shared history between Germany and the 41st FA Bde., community leaders attended the historic event, including Minister Dr. Florian Hermann from the Bavarian State Chancellery; U.S. Consul General Meghan Gregonis; and Edgar Knobloch, Grafenwoehr mayor.